Okay, let’s get to Rousas John Rushdoony (and reference his son-in-law, Gary North). These two guys are fairly big in the modern Dominionist movement. Rousas John Rushdoony, who died in 2001 “was a Calvinist philosopher, historian, and theologian and is widely credited as the father of Christian Reconstructionism.” As noted by critics and plaudits alike, Rushdoony had some interesting philosophical thoughts on life, humanity, and God Himself. As a theologian Rushdoony saw human beings as primarily religious creatures bound to God, not as rational autonomous thinkers. While this may seem an esoteric theological point, it isn’t. All of Rushdoony’s influence on the Christian Right stems from this single, essential fact. 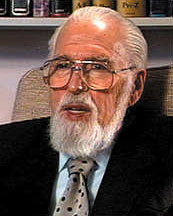 Many critics of Christian Reconstructionism assume that Rushdoony’s unique contribution to the Christian Right was his focus on theocracy. In fact, Rushdoony’s primary innovation was his single-minded effort to popularize a pre-Enlightenment, medieval view of a God-centered world. By de-emphasizing humanity’s ability to reason independently of God, Rushdoony attacked the assumptions most of us uncritically accept. Rushdoony is probably most well-known for his small book containing numerous essays he wrote titled, Law & Liberty. 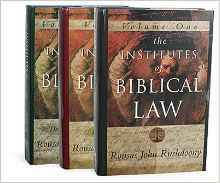 However, many believe that the book he is most know for – considered his magnum opus – is The Institutes of Biblical Law, which is just under 1,900 pages total. It is in this work that Rushdoony puts forth the idea to create a Christian theocracy. These laws and punishments were established for Israel and for no other nation. Any foreigner who became part of Israeli society willingly was also expected to obey these laws. Israel was created by God and for God in order to be a light to all nations and to bring forth the Messiah/Savior of the world. That was the purpose of Israel and America has no part in that, nor can it be claimed that America is somehow connected to Israel. Yet, this is a common theme today among advocates of Rushdoony’s writings and work. The idea that America should become a Christian theocracy is a bit frightening to me. Who would be in charge of it? Who would be “king” of America? I can easily see God’s grace evaporating very quickly under such a system, especially given the way some who attest to be Christian act toward non-Christians. Israel and Israel alone was created by God to be a theocracy. Yet, Israel was not satisfied with having God Almighty as their King and demanded they be given a human king. With the possible exception of King David, Israel experienced nothing but problems once they came to believe their nation was inferior to surrounding nations because they lacked a human king and God gave them one. King Saul, Israel’s first, was an abysmal failure. Most who followed were terrible as well. Rushdoony and others like him (including his son-in-law Gary North, who has taken up where his father-in-law left off), want America to become something it was never intended to be; a theocratic kingdom. This is Christian Reconstructionism or Dominionism in a nutshell. Since the life of Jesus on this earth (including His death and miraculous resurrection from that death), we live in an age of grace. Simply reading the New Testament gospels and epistles is enough to provide that accurate picture. Jesus fulfilled the Law in all points because it is not something we can do to achieve salvation. The Law points out our failures and does so with ease and consistency. At the same time, we have what it takes to be obedient to God (through the empowering of the Holy Spirit), so we also should do what God expects of us. But a careful reading of even the gospels (or the book of Acts), clearly highlights the fact that grace should be the constant operating principle of our lives. The Mosaic Law certainly had aspects of grace built into it, but not nearly enough because of the fact that Jesus had not yet come, lived, died, and rose again. The punishment for not obeying the 613 Mitvot – Mosaic Laws – with the exception of the Ten Commandments, are often brutal. There is a reason that Jesus essentially reaffirmed nine of the ten commandments (and fulfilled all the others), to His followers. We are to do the same, but we do it under the umbrella of grace. Christians should not lie, cheat, steal, murder, covet, commit adultery, etc. However, this is not what Rushdoony and others like him want. They envision an American theocracy where “God” is in charge and punishment for infractions would be swift and brutal. But tell me, who would be the human agent or agents of such a theocracy? Rushdoony was no apologist for democracy either, preferring a theocracy all the way around. The biblical truth seems to be that there is no sign of any revival for part of the world (including America) before the end comes, which includes the physical return of Jesus to this earth. In fact, just the opposite appears to be the case if we interpret the Bible literally. Moreover, the idea that Christians should work hard in society (especially in America) to recreate government so that a theocracy replaces our Constitutional Republic is absurd, in my view. Christian Reconstructionists see society as improving if Christians will but work to make that happen. The world is rapidly moving toward that time when it will become one in purpose. A one-world government will come about as the final version of the fourth beast first spoken of in Daniel 2. This final version of the fourth beast – some call it the Revised Roman Empire because it connects back to the Roman Empire – will come into existence and be used by Antichrist as his footstool where he will control the world, with a special eye on Israel. This is all clearly spelled out throughout the Old Testament and even in what is known as Jesus’ Olivet Discourse (Matthew 24, Mark 13, and Luke 21). Many continue to miss it because of the way they view things. The reference to “the one who makes desolate” in the above verse is referencing the Antichrist, who will ultimately be destroyed by Jesus as He returns (2 Thessalonians 2:8; Revelation 19:11). Jesus specifically mentions this same situation in Matthew 24:15. In order for all of this to occur, there has to be a one-world government and no nation will avoid being part of it and that includes what we now call the United States of America. 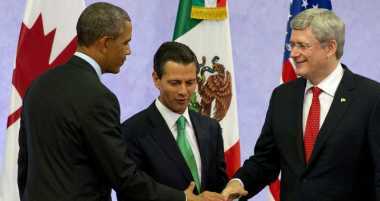 Leaders from the USA, Mexico, and Canada gather to discuss the union of North America. In fact, the North American Union (NAU) has been in the works for some time, where an international union of Canada, United States, and America are to be brought together as has been done in Europe with the EU. This is why the southern border of America will never see a border wall or fence (in spite of what Donald Trump says he will do), and why ICE has been told to simply let illegal immigrants walk into America. Eventually, the goal is to create the North American Union where this type of going back and forth will be the norm as it is in the EU. This is how the world will eventually become one, with smaller unions created first. The headquarters for such a complete world union will likely be where the old Roman Empire headquarters existed. In fact, if history tells us anything, Babylon, Medo-Persian, Grecian, and Roman Empires all existed in pretty much the same general geographical locations with slightly larger or smaller borders depending upon the empire. In the end, when the world becomes one, controlled by a centralized one-world government, the headquarters will likely be someplace in Europe, but policies and laws will affect every nation on earth. Rushdoony and others are working against what God is allowing. Therefore, they will fail because God’s higher purposes will prevail. Eventually, there will be a theocratic kingdom, one ruled by Jesus Himself upon His physical return to this planet. However, the belief that Christians should work hard to bring about a Christian theocracy now is absurd and goes against what the Bible clearly teaches will occur as we move toward the end of this age. 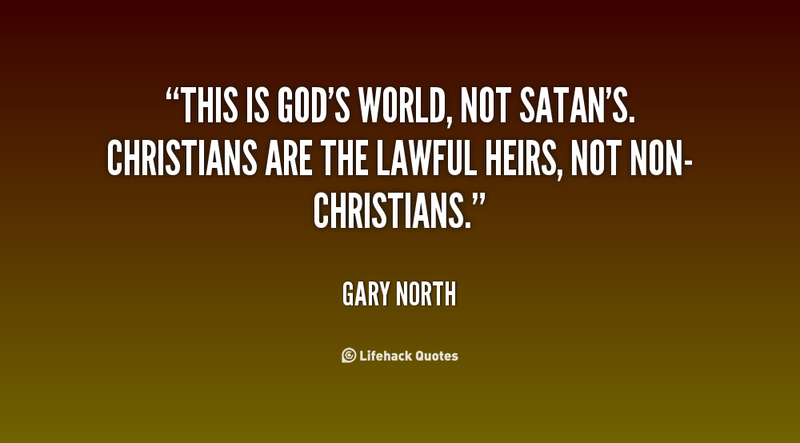 We’ll be back with more on Rushdoony’s son-in-law, Gary North. Entry filed under: Barack Hussein Obama, christianity, Cultural Marxism, Emotional virtue, eternity, israel, Political Correctness, Politically Correct, Politics, Religious - Christian - End Times, Religious - Christian - Prophecy, Religious - Christian - Theology, salvation, second coming. Tags: christian reconstructionism, daniel 9:27, dominionism, gary north, institutes of biblical law, NAU, north american union, rousas john rushdoony.